This week on Secret Golf with Elk & Knoxy, we discuss Tiger Woods and his latest comeback announcement. After posting three swing videos on Twitter over the past few weeks, the former World Number 1 announced he would make his return to competitive golf at the end of November in the Hero World Challenge. But can Tiger do it again? And what do we really expect from this comeback? Ryan Ballengee from Golf News Net joins Elk & Knoxy to talk all things Tiger. On this episode of Secret Golf, we're talking Tiger. Last month, three shots on Twitter followed by a comeback announcement, but can Tiger do it again? Today, we discuss. It's Secret Golf. It's what I'm looking for. It's why I get up every morning, call my good-timing friends. What keeps me coming back for more is Secret Golf. We're headed down the road. You just load it up, big show going looking for the heart it stole. Roll until the wheels fall off, it's Secret Golf. This is Secret Golf and it's our brand new podcast for this week. I'm Knoxy, or Diane, and of course Elk is here as well, live from Houston. A lot of buzz in Houston right now, Elk. How are you? I am a little wobbly this morning after Game 6 lost to Los Angeles Dodgers. I was lucky enough to get invited by the owner, Jim Crane, to Game 5. And there's a button that's floating around Houston that says, "I survived Game 5." And I got to tell you, I didn't get home until 4:00 in the morning. And we were just having the greatest time in the world. My son Sam and I with there, father and son at the game, with my friend Clay Walker and his son. And it was just amazing. And this series is certainly-- oh, it's just grabbed everyone's attention. It's just amazing. LA is so good and Houston is so good that, who knows what's going to happen tonight? Yeah, exactly, the big decider of the World Series tonight. But how was it in the box? You were schmoozing with the big celebs in the box, I believe. Of course I was. We were having a ball. Jim Crane, the owner, was so nervous he was pacing literally from his seat that was right behind home plate-- right there next to famous Nolan Ryan, the great pitcher of the Astros-- and literally coming back to the box. We saw him down there on TV, then he was back in our box. He literally just paced the whole game. But there's so much vested interest in Houston this year with all these lovable characters we have on the team with Altuve, and Correa, and Springer. And just this cast of characters they're so talented. We know we're going to have them for another three years. We've had a huge flood here in Houston and people have bonded around this "Houston Strong" symbol. And it's still pretty dodgy down here. People are still struggling with getting their lives back together. So this has been a nice common thread that everybody can really pull around. Every kid in town is wearing a Houston Astros shirt to school. It's amazing. I love that. And as you say, after everything post Hurricane Harvey, and the cleanup operation, and just what everyone's been through, this is a nice bit of respite and some good news to hit Houston. I have one question to ask you, though. Did you see Kate Upton at Game 5? I did not see Kate, although I wanted to. I wanted to. I think she was in one suite over. But they had a couple of guards at the door and we certainly weren't going to go in there. We were happy where we were. Verlander has been such a nice addition and Kate Upton even more so. "And Kate Upton even more so," says it all. Right, well, today on our podcast we are actually joined by a guest. From Golf News Net we have Ryan Ballengee here. Ryan, how are you? I'm great. Thanks guys for having me on. No, thank you for being here. Of course, Golf News Net. You can check out the website. All the golf news that you need right there. And of course, on Twitter social media as well. But Elk, we wanted to get Ryan on today because we are talking about one of the biggest topics. It feels a little bit like Groundhog Day. But over the past few days, we have seen-- well, past few weeks even-- we've seen swings of the one-and-only Tiger Woods hitting Twitter. And then the other day he announced that he is making another comeback. So he's going to be playing in the Hero World Challenge in the Bahamas end of this month. It's his tournament. Elk, were you expecting this announcement, first of all? Well as a back surgery person, I'm excited to see him back swinging. I had a very similar surgery. My surgery did was back. Literally did that microdiscectomy to a disc that popped out. When you think of Tiger Woods, there's so many different compelling storylines. I mean it's a book that we've all read. We've seen it from the beginning since he was aged two, swinging on TV. And we watched him through his career with all of these majors. 78 wins, 14 majors. He's had all these injuries. We all know all about his family, his coaches. It's a book and we're all waiting to see what the final chapter is. And Ryan, I must ask you right out of the gate, what is the word on the golf news street about this comeback? I think there is a sense that there's a lot of fingers crossed that this isn't too soon. Because Tiger started posting videos of him hitting pitch shots at the end of August. And then at the beginning of October-- well, the end of September-- the Presidents Cup. His [INAUDIBLE] news conference about where his game is, what he's doing. He said, yeah, I can see a scenario where I don't play competitive golf again. So in the stage of a month he went from, yeah, I could retire, to, I'm going to play golf and I'm ready to take on everybody. So I don't understand how you can do that in a month. But I guess if you have a lot of time on your hands you can. So I guess the question is, what can he accomplish in another month to get ready to play against some of the best players in the world? You have to hit and giggle, but it's still a tournament that matters to him and a place where he came back last year. So I think there's some cautious optimism that the microdiscectomy, and the spinal fusion surgery, and all that stuff has finally got him to a place where maybe he feels pretty good. Well, the doctor only cleared him to fully swing two weeks ago. Yeah. I don't know how you get from that to that. Do you think it had anything to do with the acceptance of the other players? The love that was extended to him up at the Presidents Cup and the excitement that it seemed that was brewing with all the other players? Do you think it was good for him to get out into public and hear from the other players and say, hey man, come back out. We don't care if you shoot an 80. Just come out and see us. Do you think that was a factor? I think that's a good point. I think he probably took a lot out of watching those guys perform so well at Liberty National. He seems to absolutely love being a vice captain. I mean, secondary to playing. But he seems to like being the mastermind of all the pairings and being the coach of sorts. But I'm sure he would much rather be out there playing. And I'm sure he probably got that indication from the guys that, he may not be what he once was, but any form of him that's out there is still good for the sport. So Elk, around this there's so many different factors and you touched on a few of them there. So let's break this down into the topics surrounding Tiger, what he's been through and with regards to the comeback. Well I think one of the biggest ones that has to be addressed is-- which is one that's been our generation-- is this coach thing, right? I mean, Tiger Woods is the best player, most gifted player that we've had on tour-- since I've been on tour, since Jack Nicklaus left, record wise and probably skill wise-- but he seems to feel like at some point that he needs some sort of a nuclear lesson. Something that's not simple. We've seen Chris Como, who probably deserves more criticism than he ever gets, where-- we saw a video of him jumping off a 5 meter swimming pool, giving a golf lesson on the way down. I think maybe the Golf Channel went live with it. Jackie Burke and I sit and talk-- [? Ry, ?] I'm interested to hear from you-- what could you possibly be breaking down in 0.5 of a second in his swing that's going to be so different? That's always been my question with Tiger is, why do you feel the need to change? And he has always said, because I wanted to get better. And I mean, he changed in 2003. That's not quite the peak of his game, but just after the [INAUDIBLE] game, then went to Hank and had some good experience for a few years. But there was something completely different than what he was working with with Butch. And then he came to something completely different with Sean Foley, almost like he did that on a whim. And then to go to Como-- I almost feel like Como, in a way, is coach in name only. Because obviously he really hasn't had a whole lot of time to work with a healthy Tiger Woods since they started working together, right? I mean, he's been under the knife or on the shelf probably more of the time than he's been able to work with Chris Como. So I'm curious why he's always done this. And you can enlighten me to some extent from the perspective of what a really good ball striker would feel. Like, maybe I just need to try something a little bit different. But if I were that good I would never change anything except for maybe age and having maybe slower swing speed. But other than that, I would never have changed anything if I were Tiger Woods. Just the route that he goes to the bank, right, in case someone was following him? That's the only thing you should change, right? Yeah, and of course we know that one of his swing keys back in the day was he tried to snap his left leg, right? He wrote that in the book and my son Sam, who plays at the University of Houston, he's got some big hitters on his team. And they also try to snap their left leg and they have had exactly the same problems that Tiger did. They indeed snapped it, finally, and they had-- what has he had? Seven surgeries in his left knee? He indeed snapped it. He did it. He did what he said he was going to do. Of course, it was so great watching him play. The question is, does he have enough speed now to play? Of course he has enough speed to play. I mean, out of the top 30 money winners this year that were in Atlanta, 15 of them were just of average length off the tee. It's whether or not he thinks he has enough speed to play good is the question. Do you think Tiger, or anyone kind of like him, can adjust from being a high swing speed, long distance player to a more run-of-the-mill guy who's slightly above average in both those things? Well, with the right grouping of sports in your head, of course. I mean, I think he has so much skill he knows how to close people out so well. I can't imagine him not being able to with the right frame of mind. Of course, it's always about golf. What you can't see, all of us, we all look at the golf on TV. We see a Justin Thomas or we see a Jordan Spieth and it really translates more with speed. Because when we see Spieth, he's not doing anything that's out of this world, like a Justin Thomas does, or [? length-wise, ?] or Dustin Johnson. But it's what we can't see inside of Jordan Spieth that makes him so great. Tiger has all that, of course. It seems to me that all he needs to do is find something, just some kind of a physical consistency that he can hit the ball from A to B, in a reasonable straight line, for him to be able to tap into what we know is in there, right. That's the question. So Elk, what's the reasonable time frame for someone like Tiger to start thinking-- all right, after I've built some confidence, I've played a few tournaments, I can get out of bed in the morning. I feel OK. When do you start going from, all right, I've gotten through tournaments, to, now I have expectations for high finishes? Well, I think-- as you noted earlier-- it's a bit of a hit and giggle coming up. Let's face it, this Hero World Challenge, Tiger had his name on the event. So it's good for him to go down there and play it. It's four rounds. It's no cut. And it's $150,000 to finish last. So I'd be going on too, no matter how I was hitting it. But I think Tiger Woods, there's no reason why he can't hit-- you don't need a lot of reps just to see the ball go down the middle. I mean, if you're putting any kind of decent motion on it--I mean, we all play golf, that's listening to this podcast. If you make a halfway decent swing, it's going down the middle. I just don't understand why you're in the trees or the bushes for six months until you figure something out. I just don't get it. And I think maybe he has shown-- he talked about it in his book. You know, he feared the big miss. The driver yips, if you will. We've seen it with pitching a little bit with him where he couldn't find the bottom or whatever. All these fancy terminologies for just losing his swing inside of his head. Most of us top players, you know where the head is in space every moment of the swing. It's not like you go to the top and then it just disappears inside your mind. I know where the face is every second of the way. And as soon as you hit it, you can normally say, OK, darn it, that was too much of that, and I'm going to do this, and you move on. That's how good players think. And I know he has fought the idea that he wanted to draw the ball for so long. But it's just not in his DNA. It's just not in his DNA to draw it. Can't do it any good. And he's proven that. He's absolutely proven that he can't draw it. So beyond the back problems, is it mental? Is it mental more than just physical ability or physical delivery of the golf clubs or the ball? 100%. Said to Jackie Burke when Jordan Spieth was playing the Masters this year-- and he went into the water again on 12-- and I said-- when he went, of course, double bogey the year before to lose the Masters-- I said, is the 12th hole in Jordan Spieth's head? He said, hell yes it's in his head. There's no doubt. There's a lot of in your head moments about golf. I mean, he was in everybody's head when he played. People weren't able to play their normal games playing with him because he was so in their head. So yeah, it's in his head. I mean, combining the mental and the physical, how much of it do you think is going to be him thinking that in his swing he needs to protect his back at the same time? Do you think that's going to be something that is going to be in his head post-surgery considering he only had surgery in April? Well, speaking from experience, of course, I just played golf with the great back surgeon Arthur Day from Hermann Hospital here in Houston. And he said Tiger has no pain in his back pain. He has no pain. When he had his trouble with his car and everything, he might have been on his medicine too long, or whatever, and felt the need to-- bit too much worrying about it. But he has no pain from the fusion. There's nothing there to have any pain. All the nerves are probably pushed to the side, et cetera. I had no pain, zero. Yeah, they woke me up in surgery, after surgery, and pumped my left leg because I had quad pain. And it was gone. I had no more pain. And I literally was chipping a few balls a couple of days later. Now, we discussed Tiger's surgery a little bit with Dr. Day. And he said for him to have additional surgeries he must have had more of a major-- the first surgery may not be going as well. There might have been some fragmentation below or above that they had to go back in. But those guys, those microsurgeons, don't really make that many mistakes. They're usually pretty certain that it's good to go when they close him up. So what did he have? Four? With the last one being where they fused it to make sure there wouldn't be any more fragmentation, I'm assuming. For him to have two microdiscectomies, some undisclosed third surgery, a fourth surgery that's the fusion, I mean that's the end, right? That's all they can do for you is fuse your spine together and hope it doesn't cause any more problems. So for Tiger, do you think that there's maybe this mentality that this is the end? If I get hurt again, I'm done. I can't do anything else for my-- the medical community can't help me. So do you think that there might be a sense of desperation in his game that this is definitely the last hurrah? Well, I think he wants to try. I don't think we'd ever want to sit on the couch and say, could I have come back and done some more? What is the final chapter for him? What do you see, Ryan? What would you be happy with as the final chapter? I'll ask you. You've watched his whole career. What would you think that he would want? I think he would want to win five majors and rub it in Jack's face. But I think what the realistic is maybe a couple of wins, maybe gets lucky in a major. And then you walk away with 15 and you go, ah, you know, I gave it my best shot. But he can be a revisionist when he's in his 50s and Jack's no longer with us and go, you know, Jack was really healthy. And I had a lot of back problems. So for me to win 15 was a big deal. And he can play it up over time if he goes into the sunset with some kind of upswing. I guess that's what I would think if I were him. That's what I would want to accomplish. Just to get one more big win, whatever that turns out to be. Of course, there's the Mount Rushmore of people that have-- doesn't matter what you do or say, there's always going to be that list, right, of Jack, and Tiger, and Hogan is so revered, Byron Nelson. I mean, there's so many players that are on the Mount Rushmore-- he's on Mount Rushmore now. Topping Jack's record, that's too early to tell. I mean, it's all mental, right? It's all mental whether he can play a season, whether he can get fed up with average play. There's so many variables. His age has to be a factor. His family, he's got two young kids that are out doing things. I know what it's like to have a boy and a girl when I was playing the tour and all the time that I wanted to be there. I've spent my whole life, 29 years, playing the tour. I don't even play anymore because I'd rather just stay home and [INAUDIBLE] with them. Competitive golf, he was born for it. At some point you're going to come out of the tree, from the top of the tree, and not break too many branches on the way down. So he has to come down gracefully. Ryan, let's talk about the media side of things. When the announcement was made on Sunday that Tiger was going to be making his return at the Hero World Challenge, from a personal perspective, how excited were you being part of the golfing media world? I think I have a healthy skepticism of everything these days. But about a Tiger comeback, it's hard to get excited. I mean, part of you wants to be, because I'm 34 years old. I grew up watching Tiger Woods play his entire career professionally, and that's my picture of the greatest golfer I've ever seen. And so you want to think, that guy is coming back. But he turns 42 in December. So that guy that at 24, and 25, and 26 won the Grand-- the Tiger Slam, whatever you want to call it, won all four majors in a year-- that guy's not coming back. So you have to temper your expectations that what he can accomplish. Elk's question earlier was, what would Tiger be happy with? And Tiger has to come to that conclusion too. 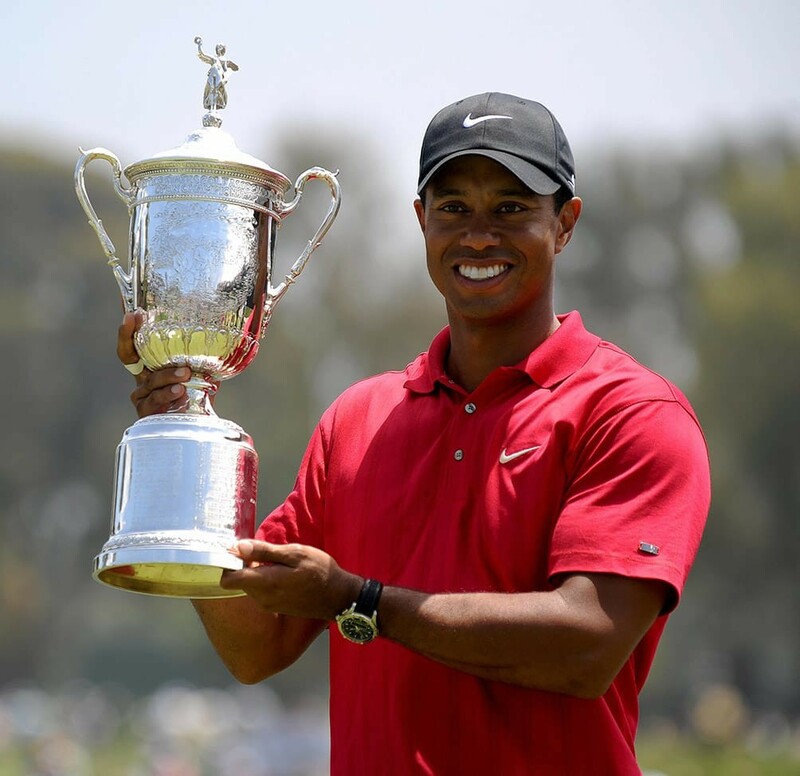 What can 42-year-old Tiger Woods be happy with as opposed to 26-year-old Tiger Woods? And I don't know if he's ever settled that issue. But I mean, the inherent excitement is there. I think that, because a lot of media have come of age-- risen with Tiger, and have fallen with Tiger to some extent, too-- there's this expectation that Tiger's going to come back and everything is going to be sunshine, lollipops, and rainbows. And I don't know that it will be. But I hope it is, because I think everyone wants to see him go out on a good term, not at bad term. Whether you liked him or not, you want to see the greats go out in a good way, not falling down in center field like Willie Mays did. You want to see them at their best one more time. So I think the hope is, just one more time. That's what anyone wants. Yeah, and Elk, do you think with Tiger-- when it comes to the golfing fans-- do you think it's possible for people to set the bar low? No, I think they want to see the red shirt. They want to see the [? charge ?] one more time. It's like, we all want to see our team do well. My son Sam, they grew up like Ryan did. They've watched him all the way. I don't think so. He's going to the Bahamas. All these guys he's playing with, I mean, they've been playing all year. They're tired. They just want to go to the Bahamas, and have some cocktails, and get in some shorts. I mean, that's not a good measure. Of course, they're going be watching Tiger. They're going to just dog him every shot they see. And they're going to dissect every swing. And they're going to ask him about his bad ones at the end, and they're going to ask about his good ones. It's going to be just a circus. But obviously good to get him back out there. His personality is not built to do like Arnold Palmer, where he can be inclusive when he goes to a tournament and go out, and enjoy the fans, and have fun, and be seen with them. He's not that guy. He's insular. At the very best, he might converse with someone in the locker room. Otherwise, he's a ghost. He's not going to age gracefully like Jack and Arnold under the tree at Augusta. I just don't see it. Now, he might a long time from now when everything cools off, but I just don't see that move. And he did, by the way. And he did by the way step on everybody's [INAUDIBLE]. But I just can't imagine him rolling into Augusta National and sitting next to one of the members, with both wearing a green jacket, talking about the old days. I mean, he's still going to be mad he didn't win the 2010 Masters when he's 55 years old. And not in a way that Jack and Artie were mad about it where they eventually just had a laugh about it. He's going to be still pissed off. Is he going to be an official tee off guy at the Masters? Is he going to tee off at the Masters? Is he going to be the ceremonial tee shot guy? I can't, I can't, I don't know. No, no, no chance. I mean, Phil, yeah. Definitely Phil. Phil will show up, and wave, and thumbs up, and all of that stuff. But Tiger, I just can't see that. Phil's going just for the peach cobbler. I mean, let's face it. Once you get past this and you can let it go, right? Hey, that's me. That's me. Once the competitive majors are over you do what you want, man. You earned it. Ryan, do you want to talk about trying to pierce the bubble of-- the bubble's not going to get pierced at all. I mean, you're never going to get the truth thing. How can someone go from not sure if he's going to be cleared by the doctor to, yeah, I'm ready to go, in a short time? I think the answer to that, Ryan, is that you can never get the straight scoop from the Tiger camp ever. So he could have been ready three months ago as far as we know, right? I always go back to this tweet Tiger said a couple of years ago when he was coming back from those back surgeries. And he said, progressing nicely. And it was him hitting at a 9 iron into a simulator and it looked like he could barely do it. And the thought was, all right. I'll tell everybody how great everything's going, and we'll deal with the details later, and then come back and play golf another year. And I think the people go back to that tweet and go, whatever he has to say, it may be true, it may not be true. You got to take it with a grain of salt. And I think that's why there's a skepticism about what he's going to do next month is, all right. Well, we've seen these videos, but they're one swing. I mean, is the stinger that he hit and shared on Twitter the eighth take? Was it the tenth take or was it the first one? Who knows. It's hard to be excited about it when you know what you've heard in the past isn't necessarily true. Yeah, good point. Very good point. Yeah and let's break that down a little bit. I mean, who can't hit a stinger on tour? I mean, give me a break. I mean, it's only a shot you hit when it's like, either you have to hit the fairways like a desperado shot almost. But back in the day he was the only guy that could carry a stinger shot. He got 230 yards with an iron, right? Everyone else hits it so low it won't get to carry. So it's a lay up shot through a gap or out of the trees. And that was a shot that's been around for 50 years. Hogan hit the stinger. And I've even read Golf Digest guys had invented the stinger, but they really didn't. Claude Harmon taught Tiger Woods that shot back in about the '80s when he was here in Houston for the US Amateur. But hey, you know. And [INAUDIBLE] it's a 280 yard stinger these days. So it's not the most amazing thing you've ever seen. It might have been really cool back then. But like you said, that was one of his shots to protect against that big miss we talked about, that he knew he could hit it low and hit it straight. So if he didn't hit it right, or didn't hit it properly, it wouldn't go spray all over the map. --is going to feel at impact. Yup. Sure he's got some kind of speed there, you know? Yeah. I think that's-- like we talked about earlier, how much does he have and can he manage that to get around the golf course? That's why I think, Ryan and Diane-- I think it's so important to keep your swing mechanics so simple. I basically swing the same as I've swung since I was about 15. I mean, I keep telling everyone, the two best players on tour to me-- or three-- Dustin Johnson, Jordan Spieth, and Justin Thomas. And they haven't changed their swing at all since they were kids and they're not going to. So they're really good at it. They're really good at reproducing what they've done their whole life. They don't have to change it and start over. There's been exceptions, of course. Like Nick Faldo changed his swing totally. Tiger's changed his swing. But it takes a long time to get really, really good at a new deal, if you understand what I'm saying. Yeah, I mean, you might make tweaks here and there. You might make slight alterations over time, but a complete overhaul once-- much less twice or three times-- just doesn't happen to the greatest golfers in the world. They can swing that way for their lives, because they got their swinging that way. So it's hard to imagine a guy pulling this off for a third or fourth time. But I guess that's going to be the intrigue of all this is can Tiger do this one more time? And by the way, for the record, I never would ever look at a guy's swing and tell him whether he's ready for anything. You have to see what the ball says. Before we had track bands and everything, the ball tells you what's happening. For example, if you stand on the 17th hole at TPC Sawgrass into a 10 mile an hour wind, and got the island green, and you're trying to hit a low medium trajectory pierced 8 iron or something, and it goes way high? Then you've got a big problem. I mean, your ball has to do what you want it to do. There's an old saying in sports-- and it's relevant to the Astros and the Dodgers-- the person who controls the ball the most, the one who has the most spin on it, correct spin, rules the day. And if we expanded that thought just a little bit further-- when you think of ping pong, or you think of snooker, or you think of tennis, or you think of baseball-- anyone who throws something with no spin straight ball? He gets slaughtered in baseball, right? The person that curves the ball-- Trevino comes to mind. These masterful players that control the spin of the ball. So the more control over the ball, the more money you make. I mean, that's what Mr. Burke and all those guys-- Hogan, Spieth, Demaret-- more spin? More money, more control. So looking at a swing, I mean, you'd line them up. Jim Furyk, unorthodox, controls his ball. US Open champ. Jordan's Spieth controls that ball around the greens, makes the ball spin properly. I mean, you name it. They've got control of the spin. And the amateur guy doesn't have control of the spin, right? He's spins it off into the trees, right? Or doesn't know how to stop it when it's coming in. So it's a control of the ball. I don't care if Tiger played cross hand if he has control of the ball. That is what he's searching for, control. Yep, that's exactly right. Can he find a way to-- as we said-- avoid the big miss, but more importantly than that, do what he wants to the golf ball when he needs to do it? And if he can do that, it doesn't matter how far you hit it, within reason. But if you can control that golf ball, you can do a lot of things. You could do it all if you have control of the ball. Just like that Kershaw. Kershaw is getting $35 million a year to curve it the most, right? On demand. On command, right? You got to beat the other [INAUDIBLE] but he's a nice pitcher. Well guys, no matter what Tiger does at the Hero World Challenge, everyone is going to be watching. He puts a video of one swing on Twitter and the world goes crazy. So hopefully he can put together four good rounds and we'll just have to wait and see what happens with the latest Tiger Woods comeback. Anyway, PGA Tour this week. Off to Vegas for the Shriners, so that'll be good. We have had some fantastic results, Elk, for our Secret Golf players over the past few weeks, especially on the Asian events starting with Pat winning in Malaysia. And then for Pat Perez he's had a great couple of weeks. He certainly has. I think he text me and I said, how much is this? Like, four? I'm talking millions for the year. And I think he sent me back a five point something that he's won since Mayakoba last year when he was off the tour. Of course, Brian Harman went over there and finished back-to-back top tens, was good for Secret Golf. Patton Kizzire and Jason Kokrak both finished in the top 10 at the Sanderson Farms. Stacy Lewis played well over in Korea. So Ryan let me ask you, are into this wraparound deal or are you not? I would say I'm not. And not because I don't like the golf. I mean, I like watching great players play great golf. But it's just hard to be excited when there's golf literally every week of the year. And at a certain point, just like the players, got to take a break. You got to tune it out, and not think about it, and think about something else. I know it's my job, and so I got to do it, but at a certain point I'm just going through the motions. And that's how I feel about these tournaments until basically the end. And then you get to the end and-- if it's a close one-- you want to watch that. But other than that, it's hard for me to be excited Thursday, Friday, Saturday. So that's what I try to do to manage watching them, is just tune out Thursday, Friday, Saturday and be excited on Sunday. Of course our commissioner Jay Monahan would counter that by saying that he is trying to give more opportunities to the [? depth ?] of the tour. So the guy that's the 100th rank tour guy, they want him to get 25 events in. But I think what's the fine line, the thread is-- like Houston Open, we've been in business down here for 50 years. We can't even get a sponsor for the Houston Open. So it becomes this jam-packed calendar. Who wants to put up the most money to get into the honey hole of the calendar, near the Marshes, or around the US Open, or near the PGA, and all this when we know that the golf season is important to everyone. And it's very hard to go out there and sell those sponsorships right now, I think, to some of these lesser events. And they're still requesting good players to go over and play in all these great events, like in China. And they play FedEx Cup events in China. So it's too much. It's too much. The tour was not built that way. It's always built around the star players. And when you think of Jack Nicklaus, when I was in meetings with him-- when I was in meetings, I was a tour member and meeting when Jack was in-- and they always felt that that 25 number was the number that was the attention span of the country. Four majors surrounded by two or three on each side was the right number. I think that's how most people feel. They tune out a lot of weeks of the year. I mean, they're good tournaments. They're run well, they've nice purses, they've great players in them, but $10 million a year-- it's hard to do when you've got 47 other tournaments around you that also get good fields and get good pub. And you're not the only game in town. Yup. Well, Diane, it's been an interesting subject today talking about Tiger Woods. And of course, our Secret Golf players, even though they are tired and exhausted, they're going to trudge on. And we've got some players that we're going to be announcing very soon that we've signed. Ryan, we'll be sharing with you maybe in a week or so. We've got some new young guns for you to watch from the Secret Golf squad. Secret Golf had a hell of a year, Elk. So hopefully 2018 is as good for you guys as 2017 has been. Excellent. Ryan Ballengee from Golf News Net. Thank you so much for being on the podcast today. And of course, yeah, we will be keeping you up to date with everything for you to be on your website in the golf news world. Thank you for having me on, it was a blast. And always good to hear from you guys. And I love the podcast, so keep it up. Thank you. And Elk, are you on the golf course right now? I am. I'm working on something. Not quite sure yet. But Ryan, mate, I'll see you around. When I say working on something, I'm always working on something to bring goodness and greatness to our faithful subscribers to Secret Golf. Bringing more and more secrets to them. I mean, you're on the golf course every time we do the podcast now. I thought you meant you were working on something as in with your game working on something. And I was like, oh, what could this be? No, sometimes I just like to do my job from a golf cart on the back of the range and hit a few. And it's what I do. I mean, who wouldn't want to work from there? Exactly. Thank you, Ryan. Thank you, Diane. Thank you guys, have a great week. And good luck to the Astros tonight, Elk. If the Astros do win tonight then can you imagine the party that he's going to be having in Houston? I might want to be there. Anyway, thank you for listening. Another podcast from Secret Golf. If you haven't subscribed already, please do so. It's so easy to do. Just get on the iTunes podcast store and search for Secret Golf. All of our podcasts are up there so you can have a little listen. Also we're doing them in conjunction with Golf News Net, so make sure you check them out on Twitter and at golfnewsnet.com. You can hear all of our podcasts there. Great to have Ryan Ballengee from GNN on the podcast today. And also, as ever, make sure you check out secretgolf.com. Elk said just a few minutes ago we have some big stuff we're going to be announcing soon. New players that we've signed to Secret Golf. But our player channels are always up there where you can learn from the best, including Jason Dufner, Pat Perez, Ryan Palmer, Stacy Lewis, Brittany Lang, Gerina Piller, Steve himself-- the list goes on and on. All of our players and their player channels are up there right now at secretgolf.com. Thank you so much for listening. I'm Knoxy and we'll be back with a brand new podcast next week.